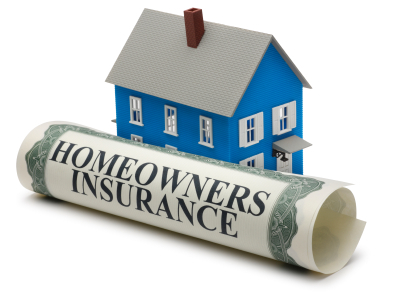 A homeowners insurance policy is a package policy that combines more than one type of insurance coverage in a single policy. There are four types of coverage that are contained in the homeowners policy: dwelling and personal property, personal liability, medical payments, and additional living expenses. Homeowner’s insurance, as the name suggests, protects you from damage or loss to your home or the property in it.Remember that flood insurance and earthquake damage are not covered by a standard homeowners policy. If you buy a house in a flood-prone area, you’ll have to pay for a flood insurance policy that costs an average of $400 a year. The Federal Emergency Management Agency provides useful information on flood insurance on its Web site at www.fema.gov. A separate earthquake policy is available from most insurance companies. The cost of the coverage will depend on the likelihood of earthquakes in your area. Private mortgage insurance and government mortgage insurance protect the lender against default and enable the lender to make a loan which the lender considers a higher risk. Lenders often require mortgage insurance for loans where the down payment is less than 20 percent of the sales price. You may be billed monthly, annually, by an initial lump sum, or some combination of these practices for your mortgage insurance premium. Mortgage insurance should not be confused with mortgage life, credit life or disability insurance, which protect you and are designed to pay off a mortgage in the event of your death or disability.You may also encounter “lender paid” mortgage insurance (“LPMI”). Under LPMI plans, the lender purchases the mortgage insurance and pays the premiums to the insurer. The lender will increase your interest rate to pay for the premiums — but LPMI may reduce your settlement costs. You cannot cancel LPMI or government mortgage insurance during the life of your loan. However, it may be possible to cancel private mortgage insurance at some point, such as when your loan balance is reduced to a certain amount. Before you commit to paying for mortgage insurance, ask us about the specific requirements for cancellation in your case. Title insurance is usually required by the lender to protect the lender against loss resulting from claims by others against your new home. In some states, attorneys offer title insurance as part of their services in examining title and providing a title opinion. The attorney’s fee may include the title insurance premium. In other states, a title insurance company or title agent directly provides the title insurance.A lenders title insurance policy does not protect you. Neither does the prior owners policy. If you want to protect yourself from claims by others against your new home, you will need an owner’s title policy. When a claim does occur, it can be financially devastating to an owner who is uninsured. If you buy an owner’s policy, it is usually much less expensive if you buy it at the same time and with the same insurer as the lender’s policy.To save money on title insurance, compare rates among various title insurance companies. Ask what services and limitations on coverage are provided under each policy so that you can decide whether coverage purchased at a higher rate may be better for your needs. However, in many states, title insurance premium rates are established by the state and may not be negotiable. If you are buying a home which has changed hands within the last several years, ask your title company about a “reissue rate,” which would be cheaper. If you are buying a newly constructed home, make certain your title insurance covers claims by contractors. These claims are known as “mechanics liens” in some parts of the country. The American Land Title Association has consumer title insurance information available at its website,www.alta.org.